Aam panna is the healthy and refreshing drink. 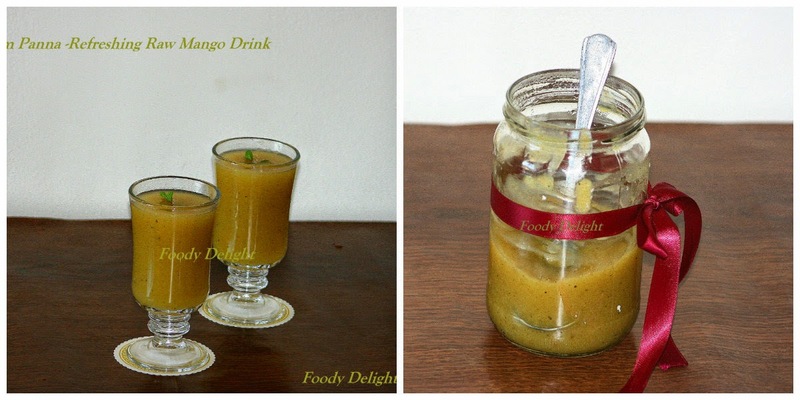 The word “Aam” is the raw mango and “Panna” is the drink. This drink is basically flavored with roasted cumin powder, peppers and mint leaves. So it has combination of tangy and spicy taste which makes this drink more tasty and delicious. This beverage is the good source of vitamins and also considers being the effective remedy of heat stroke during the summers. So it is the one beverage which is mostly relish on summer days but no harm to try in any day of the year. What you say? So try out this refreshing drink and enjoy it chilled. Steam the raw mango and take out all the pulp by squeezing the mango. Collect all the pulp and add it into the blender. Add in sugar, roasted cumin powder, black salt, pepper powder, mint leaves and 1/4 cup of water into the blender. Blend the mixture for around 5 minutes. Strain the mixture by using good strainer or muslin cloth. Collect the strained paste into separate bowl and discard any residue left behind. Take two glasses, add in 2 tbsp of concentrated paste, 1 cup of water and few ice cubes into each glasses. Stir well so that the paste is well diluted with the water. Here we go Chilly Aam Panna is ready to serve. For extra kick, add pinch of chat masala in the panna.